The mayor’s Charter Revision Commission met on Tuesday at the Pratt Institute for the third of its four expert advisory issue forums, this time discussing potential changes to community boards and the city’s land use process. 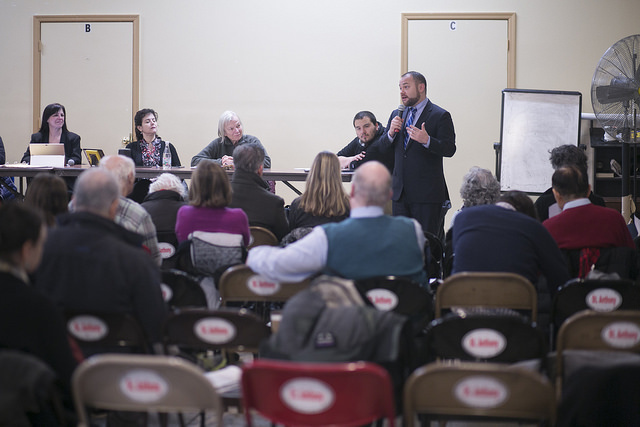 The first meeting, held last Tuesday, focused on voting and election reform, while the second, held last Thursday, focused on campaign finance reform. The commission, consisting of 15 members appointed by Mayor Bill de Blasio, including Chair Cesar Perales, will finalize a list of proposed changes to the city charter by early September that will then appear on the general election ballot in November for voters to approve or disapprove. Stakeholders and experts such as City Comptroller Scott Stringer, community board members, academics, and advocates provided commentary and recommendations for the commission regarding the issues of community boards and land use; on some issues, the panelists and the commissioners all seemed to be in broad consensus, while on others there was evident discord. One area of relative cohesion was a recommendation that all community boards have a full time expert on urban planning as a paid staff member, though it is unclear that this would rise to the level of being charter-mandated (there has been City Council legislation introduced to make such a requirement for each community board, which, if passed, would become a part of the city’s administrative code, not the charter). Most community boards are said to be understaffed and rely on volunteers to do important work; board members are all volunteers, which can both tilt the demography of the boards in certain directions, like wealthier than the represented area, and lends itself to a general lack of intimate knowledge of planning. “A community planner would be a game-changer in communities that are experiencing extraordinary land use applications, and quite frankly, they don’t have the expertise and they’re at a tremendous disadvantage,” Stringer said. Stringer also recommended that the city provide training on issues of land use to members of community boards on a periodic basis, something that Stringer said he prioritized as Manhattan Borough President (borough presidents appoint most community board members in their respective boroughs). Stringer did not, however, endorse community board member term limits, breaking with some of his fellow testifiers. “When you have term limits, you also have a lame duck status that sets in,” he said. “We’re gonna see that with people now in their fifth year wondering what office they’re gonna run for next, and I dare say you’re gonna see a lot of musical chairs and people thinking about the future, not necessarily the job in front of them. And that’s just the reality of elected term limits,” he said, in apparent reference to the dozens of City Council members, five borough presidents, and three citywide officials who are all term-limited at the end of the current term. Instead, he endorsed a process undertaken during his borough presidency of periodic reviews of board members, reappointing those doing a good job and sacking those who weren’t. Community board members who testified did not offer unequivocal support to term limits. Rachel Bloom of government reform group Citizens Union, meanwhile, took an unambiguous stance in favor of term limits. Stringer claimed that community boards have deviated significantly from their ancestral origin in 1951, at the impetus of Manhattan Borough President Robert Wagner, as Community Planning Boards. The comptroller said that, with numerous elected officials maintaining district offices, the use of community boards for constituent services draws resources away from the more integral tenet of land use. During the portion of the commission hearing focused on land use, two general themes played out among the speakers: that the land use process does not adequately facilitate community input and that the process is more geared toward short-term zoning concerns and less toward long-term community planning. Gates recommended the creation of an “Office of Community-Based Planning” to assist communities, and community boards, in land use and planning. Gates also recommended a charter codification of a “fair share” program, wherein communities shoulder burdens of ill-desired land uses, like a sewage treatment plant for instance, equally, instead of being shouldered disproportionately by communities without the political and social capital to fight those land uses. Others, such as Hunter College professor Tom Angotti, said that the important decisions are often made unaccountably in the “pre-ULURP” process, meaning a period before the city’s official Uniform Land Use Review Process that takes land use decisions from developers or the City Planning Department to community boards to the Borough President and Borough Board to the City Planning Commission and, finally, to the City Council. “All those discussions that go on, side discussions, agreements that get made behind closed doors, are part of the undemocratic process that precedes ULURP,” said Angotti. “And it’s followed by a series of public hearings, at the community level, at the borough president level, at the City Planning Commission level, at the City Council level, which are more theater than true democracy. Why? Because we’re stuck in a method for participation that is bankrupt.” Angotti noted that concerned citizens are often forced to wait hours in order to testify for three minutes to a few sleepy-eyed bureaucrats. Angotti also recommended that ULURP decisions be made based on preordained “197-a” plans submitted by community boards, rather than on an ad hoc basis. Since the 1989 charter revision that established 197-a plans considerable by the City Planning Commission, only 17 community plans have been submitted to the city. “The biggest single reform could be a charter requirement that every ULURP action be consistent with a 197-a plan,” forcing both community boards to submit such plans and the City Planning Commission to take them seriously and not simply shelve them. Commision Chair Perales, however, criticized the land use panel of testifiers as failing to clearly present their recommendations in a digestible manner. With only two weeks left for the City Council to vote on the proposed rezoning of East New York, all eyes are on City Council Member Rafael Espinal, who is leading negotiations with the de Blasio administration and whose approval of a revised plan will determine its fate. Espinal has promised significant improvements to the plan put forward by the city and community organizers and advocates are calling on him to reject the rezoning if it does not deliver what they see as adequate affordable housing, local hiring, and other provisions. Meanwhile, Espinal's colleagues and many others are looking to him as the East New York negotiations with the de Blasio administration will set the precedent for rezonings across the five boroughs. The city's proposal to rezone East New York was passed almost unanimously by the City Planning Commission on February 24, giving the City Council the next fifty days to vote on it as part of the city's Uniform Land Use Review Procedure (ULURP). The neighborhood is the first of 15 the city plans to rezone as part of Mayor Bill de Blasio's ambitious plan to create and preserve 200,000 units of affordable housing. The plan aims to change land use rules and implement community improvements in order to make East New York more desirable and liveable, while fostering development that will include thousands of new units of housing, many of them with rent regulations. Negotiations so far have been slow going, leading to a series of news reports this past week indicating that Espinal and others on the City Council side of the bargaining table are frustrated with the de Blasio administration. The parties are set to hold another meeting on Monday afternoon at City Hall, which participants hope will yield progress. "There's a lot of frustration because we've proposed changes to the plan and we've been waiting for [the administration] to come back to us," said Espinal, whose district covers a vast swathe of the area in the plan - the City Council traditionally defers to the local Council member to approve or disapprove land use deals. Espinal has made his priorities clear: "serious anti-displacement measures, a strong jobs plan and truly affordable housing." While he insists there has been no push back from the administration against his demands, the lack of movement seems to be testing his patience. "The clock is ticking," he said. "We've been working on this for over a year. It's time to talk turkey." Espinal did say that one cause for delay was that both the administration and Council had been preoccupied until last week with the Mandatory Inclusionary Housing and Zoning for Quality and Affordability proposals, two citywide zoning amendments that lay the groundwork for the neighborhood rezonings that are set to go from East New York to Flushing, corridors in the Bronx and on Staten Island, East Harlem, and beyond. The de Blasio administration has reiterated its commitment to the process. 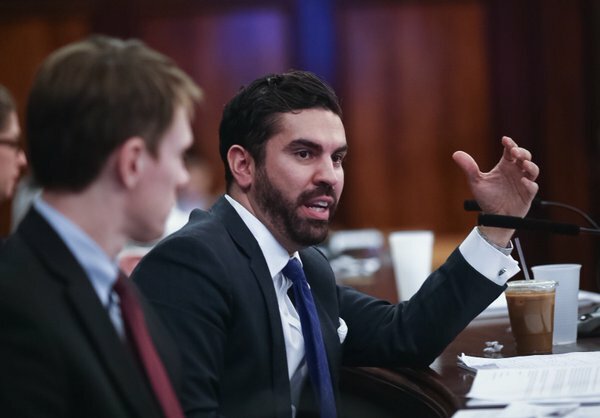 "The city is currently having very productive conversations with Council Member Espinal on the East New York rezoning plan," said Austin Finan, a spokesperson for the mayor, in a statement. "Since the beginning of the East New York planning process, we have been and remain committed to ensuring that the final proposal to be voted on by the City Council meets the affordable housing and community infrastructure needs of East New York residents." Espinal will meet with city officials on Monday to hammer out the details of the East New York plan. On the Council side of the table, he'll be joined by Council Member Donovan Richards, chair of the Subcommittee on Zoning and Franchises, and Council Member David Greenfield, chair of the land use committee. Also expected to participate are the Council's land use director, Raju Mann, and the chief of staff to Council Speaker Melissa Mark-Viverito, Ramon Martinez. According to a source with knowledge of the discussions around the rezoning, key sticking points include not only ensuring deeper levels of affordability in new housing, but also extending affordability for about 1,000 current residents whose rent-regulated apartments are nearing expiration of their terms; details of the city's commitment to a Workforce1 job training center; and progress around adding school seats and day-care slots - two areas of need in the administration's final environmental impact assessment of the rezoning plan. "We have an opportunity to show that we are attacking inequality head on in East New York and the administration needs to take this issue seriously as we negotiate the first rezoning under MIH and ZQA," said Council Member Richards in a statement. "The lack of progress thus far on these negotiations is deeply concerning and we need to see legitimate movement soon to ensure that the needs of the community and Council Member Espinal are met." All the stakeholders -- Espinal, his colleagues, community leaders, housing advocates, de Blasio administration officials, real estate developers, and others -- recognize that these rezoning negotiations will set the tone for the next fourteen and determine the future of housing and development in the city for decades to come. "What I'm doing in East New York is the reason I ran for office," Espinal said. "It's an opportunity to create the strongest affordable housing plan in the city and set a precedent for how the rest of the city approaches rezoning." He has received strong support from his colleagues who, he said, "feel that whatever deal I'm able to reach with the administration, they can work off of when their neighborhoods are up for rezoning." Council Member Peter Koo from Queens is likely to be next in the hot-seat as the Flushing West rezoning proposal moves through the ULURP process. "We're certainly watching what happens in East New York closely," Koo said in an email, "but the Flushing West rezoning proposal is significantly different. Our rezoning area is on the waterfront which limits depth, and the LaGuardia flight path limits height. Flushing also has serious infrastructure needs that a large-scale rezoning of this nature would need to address. So we're watching East New York to see how the city responds to the community because Flushing also has a long list of needs." Housing advocates also recognize the immense pressure that Espinal is facing, although different groups have taken varied approaches to respond. "The guy's in a difficult spot," said Jonathan Furlong, zoning technical assistance coordinator, Association for Neighborhood and Housing Development. "What he decides in East New York has vast and far reaching implications for the Bronx, East Harlem, Flushing, Upper Manhattan." ANHD has provided technical assistance to the Coalition for Community Advancement, a collaborative effort by housing advocates to address issues of rezoning across the city, communicating with administration officials, elected representatives, and residents. Members have met with Espinal numerous times to air their concerns and will also be meeting with Council Speaker Mark-Viverito. The CCA has called for a scaling back of the East New York plan and has proposed its own alternative community plan. Besides more affordability for current residents, they want manufacturing sites removed from the plan to protect manufacturing jobs, a $15-million small homes preservation fund, the preservation of the Arlington Village development as affordable housing, and mechanisms to set aside space for community facilities. 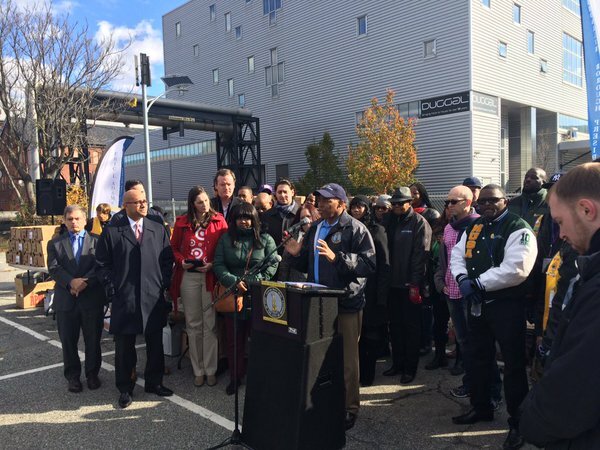 On Sunday, the coalition held a rally outside City Hall to tell the Council to vote against the rezoning plan unless these proposals are embraced. The group said Sunday night that about 120 people rallied, including community members, State Senator Martin Dilan and Assembly Member Latrice Walker. Furlong commended Espinal for being firm with the administration, but faulted him for not being more vocal on specific proposals. "It's tough to get a read on him," he said of the Council member. New York Communities for Change, a grassroots advocacy group, has been more critical. NYCC released a report titled "Educating Espinal: How to Deepen Affordability for Thousands of Apartments in East New York and Protect Low-Income Residents" in which they directly called on Espinal to fight for more affordability in the plan. "The Council member has not yet come out in support of a growing cry in the community for deeper affordability for low-income families," said Jonathan Westin, NYCC executive director. The group, which claims about 1,000 members, has two demands: 50 percent of units in new developments affordable for families making about 40 percent of the $77,000 annual area median income (AMI), and union jobs for workers in any new construction along upzoned areas. AMI is a federally-calculated number for all of New York City and surrounding counties. The area median income in East New York is significantly lower - about $35,000 per year for a family of four, about the same as 40% of AMI. "We're pushing that if that's not part of the plan, he should vote "no,"" said Westin. "He should not vote against the interests of his constituents." Asked recently about the East New York rezoning and the pushback it has received, Mayor de Blasio said that development and gentrification are taking place all over the city and that the city must take action to harness it. On WNYC's The Brian Lehrer Show, the mayor said on March 18 that "the worst thing in the world is to do nothing about" gentrification. "And bluntly," he said, "that was the broad approach of the previous administration and I point to neighborhoods like Bushwick and Bed-Stuy as classic examples where there was no rezoning" to offer developers more in exchange for community benefits. Saying that there needs to be "a coherent governmental response" to gentrification and displacement, de Blasio said that "rezonings are absolutely necessary to create that affordability...if we don't do it, you'll see displacement with no countervailing action by the government." The mayor indicated that the East New York plan will include many affordable units for both lower- and middle-income residents. It is negotiations on the plan that will yield the full details of what that government response is, in East New York and elsewhere. On Thursday, New York Communities for Change led a rally in East New York, blocking traffic along Atlantic Avenue to draw attention to their demands. "Along Atlantic Avenue is where lots of developers have bought property and stand to make a windfall of profits from the rezoning," said Westin. "We need to ensure that with the increase in density that they get from the rezoning, there are deep affordability standards and real job standards for workers building these buildings." Espinal was blunt about NYCC's efforts. "I don't need any educating," he said of their report. "I was born and raised there. I know exactly the struggles my constituents are going through." Insisting that he prefers a "pragmatic approach," Espinal said he wants a holistic plan that covers all constituents and their needs, and that the administration has been receptive. "To be fair, they've been listening," Espinal said. "But the time to listen is over. It's time to take action." Note: this article has been updated with details of the Sunday rally. At Brooklyn Borough Hall on Monday, Borough President Eric Adams held a public hearing on the de Blasio administration’s controversial East New York Community Plan. After remarks from City Council representatives at the packed-to-capacity hearing, stakeholders from the affected area urged Adams to reject it. “What I’m gonna stand here and talk about is you putting yourself in the position of these community members, young and old, who are coming to you and asking you to just look at the mayor’s plan and just understand that it’s crap,” Jasbir Singh, Brooklyn organizer for the advocacy group Faith In New York, said at the hearing, addressing Adams directly. Though most opinions expressed were less harsh, only two people - officials from the City Planning Department who provided a powerpoint of plan details at the hearing’s start - voiced approval for the proposal, at least in its current form. The plan aims to create affordable housing units, protect existing ones, and strengthen the economy of the area proposed for rezoning, which contains East New York, Cypress Hills, and Ocean Hill. The area has high poverty rates and is largely populated by people of color. There are limited work and transportation options. It is an area that could be upzoned to allow more retail space, as well as new housing development. The administration’s plan seeks to create new housing that will include “affordable” units, while also fostering new business and jobs as buildings are “mixed-use,” meaning retail on the ground floor with housing atop. On Monday at Borough Hall, participants urged the city officials present to vote against the proposal. Though it has already been rejected by Community Board 5 (East New York, Cypress Hills, Highland Park, New Lots, City Line, Starrett City, and Ridgewood), Community Board 16 (Brownsville and Ocean Hill) could endorse it when it votes at the end of the month. These votes are advisory, though - the City Council is expected to vote on the plan in 2016. The Council typically follows the lead of the local rep(s), which is this case are Council Members Rafael Espinal and Inez Barron. The East New York area is one initial proving ground for the de Blasio administration’s larger rezoning and housing plans - plans that are being met with resistance all over the city and are likely to be tweaked before they are presented to the Council. Most of the concerns expressed Monday were about the proposal’s potential to displace residents of the rezoned area. Around 50 percent of the approximately 6,300 housing units created for the East New York Community Plan are slated to be affordable units. The remainder are market-rate. During her remarks at the start of the hearing, Council Member Barron held up a sheet of paper with two pie graphs. One showed the current East New York community by percentage of income levels and the other showed the same statistics as forecast after the rezoning, she said. Barron reaffirmed her stance on the proposal: as it currently exists, she does not support it. Council Member Espinal, who represents most of the area proposed for rezoning, expressed the same stance in his remarks. Despite some concerns mentioned about the proposal’s economic plan, which does not require that businesses interested in East New York pay workers a “living wage,” most concerns voiced were about the plan’s potential to displace residents. In the plan, one of the strategies listed for the protection of existing affordable housing is providing free legal representation from the Tenant Harassment Prevention Task Force for people facing harassment by landlords. Several who spoke at Monday’s hearing reported that they had personally experienced this type of harassment, and doubted the capability of the legal representation strategy to fight it. “I cannot accept a legal clinic at face value as being able to solve that problem,” five-year East New York resident Barbara Champion said. Mayor de Blasio has personally guaranteed such legal help to tenants in any of the neighborhoods he plans to rezone and has dedicated budgetary dollars toward such aid. East New York is one of 15 areas selected by the de Blasio administration for rezoning. The proposals are part of Mandatory Inclusionary Zoning and Zoning for Quality and Affordability, two main pieces of the mayor’s Housing New York plan that are being reviewed by community and borough boards now before some version goes to the Council. Local reception to planned rezonings have been mixed, largely skewing negative. Community boards in Park Slope and Carroll Gardens have voted in favor of rezoning plans; due to possible overcrowding, a Long Island City community board voted against; and the Movement for Justice in El Barrio advocacy group recently interrupted a Community Board 11 meeting to protest against East Harlem’s proposed rezoning changes. The Bronx and Queens Borough Boards voted against the plans and other boroughs are set to vote soon. Again, these are all advisory opinions. Brooklyn Borough President Adams did not give a verdict on the city’s proposal at Monday’s hearing. “I did not come into this room with my mind made up,” the borough president said. He encouraged community input, letting participants do the talking as he listened and eyes his Borough Board meeting on Tuesday, December 1, which will include a vote on the mayor's two larger rezoning plans. As part of the city’s Uniform Land Use Review Procedure (ULURP), the borough president reviews the proposal and has the power to recommend it to the City Planning Commission, the final body that reviews it before the City Council. This article has been updated to more carefully reflect Borough President Adams' comments at the town hall.